Learning about volleyball skills. How to pass? How to serve? How to block? How to dig? How to develop basic volleyball technical skills further? This section is for a starting volleyball player to get a clear understanding of basic skills, or for a starting coach to learn how to teach those skills. After explaining the basics, we will go into deeper aspects of each skill and present how to develop skills further. Volleyball Skills - What Volleyball Players Should Learn First? Before getting into learning technical volleyball skills, there are some important essentials that need to be addressed and learned first. 1. Volleyball Basic Position. Volleyball Stance. A basic position, a stance in volleyball is a comfortable, good balanced position. A player has a well-balanced volleyball stance when her feet are slightly wider than your shoulders, knees are bent (hips are lowered closer to ground) and body weight is shifted a little bit more on the ball of you feet vs. heels. Volleyball players use the basic stance as they prepare for the serve receive or defense - when they are getting ready to move to the ball. 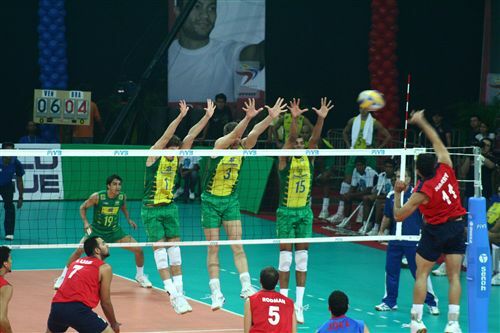 Shuffling is the basic footwork used in volleyball. Shuffling is the correct way to move under the ball when receiving the serve or defending the offense. When shuffling a player moves either forward, backward, left or right. The most important thing in shuffling is: feet should not cross-over. Shuffling is crucial when moving to the ball, especially when a player has to do little adjustments in the last moment when the ball approaches. not crossing over with your feet. Volleyball Skills - How to Practice Shuffling? After introduction, the best way to practice shuffling is to combine it to volleyball passing or defensive drills. Make players takes few shuffle steps before the pass or defense - just like it happens in the match. 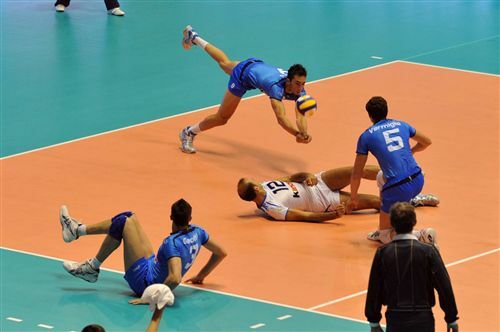 Very rarely volleyball players do not have to move before the pass or defense in the match. A good idea is to integrate footwork drills, including shuffling, into the practice. When practicing shuffling coaches should pay extra attention that players stay low in their basic position (hips closer to ground, knees bend, good balance, weight on the toes). Players get exhausted very quickly if it the position is low and shuffling is done with a good speed. It is important to run relatively short 10-15 second sets and give players little rest between the sets. For example, coach can add 4-6 sets of shuffling in the beginning of practice, and possibly repeating the sets in the middle or end of practice again. The coach can spread the players all over the court having some distance between players. Then players will move simultaneously around the court according the signs (left, right, backwards or forward) of the coach, changing direction rapidly. The coach can also add a dive into the shuffling exercise. When the signal is heard, the players need to dive to get up as fast as they can to continue shuffling. When the team learns other type of footwork, for example a blocking footwork, spike approach footwork or some short bursts of sprints, also those can be added into the mix. We present few ideas what we have been using in volleyball skills training. Most of these principles can be applied to any player level, from the beginners to pros. The learning process is always similar, no matter how old or experienced the players are. Show players a clear image of the skill. The coach could demonstrate it by him/herself or to use a player as a model. Alternatives are to show the example by using video or pictures. Repeat it several times. When players learn to think about the skill (cognitive learning)  and keep their mind fully focused on what they are doing - they will learn the skill better when performing it (motor learning). When players become more aware about the techniques, it draws a clear picture in their mind how the skill should be done. As a result players learn to correct the errors and improve the techniques by themselves. They learn to notice little mistakes what they did when performing the skill. This type of thought process in training gets us into method called visualization. You can read more about visualization in the other sections. By game-like drills we mean drills, which mimic the game. For the beginning players the volleyball skills needs to be introduced  without the net  or even without the ball first. However, the goal is to move to the game-like drills as soon as possible. It is definitely not rocket science that players learn the volleyball skills needed in the match by repeating the skills in the practice. Therefore, run game-like drills as much as possible! 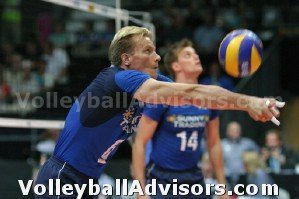 How to Run Game-like Volleyball Drills? These following set ups are not always possible due to lack of space, amount of players, players skill level, or any other reason - but the coach should always aim to use the following game-like settings. When practicing passing, the ball should be sent from the other side of the net, just like in the match. When practicing setting, the ball should be served over the net, and passed for the setter. 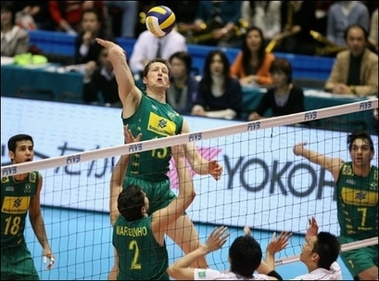 Also there could be a block in the other side of the net, which the setter is playing against. (If not using the passer, the ball feeder should be feeding different kind of balls for the setter, just like in the match, where the pass is constantly different. When practicing offense, the ball should be served over the net - and passed for the setter before the offense. There should a block and defense for the hitter. When practicing defense, the ball should be hit over the net. 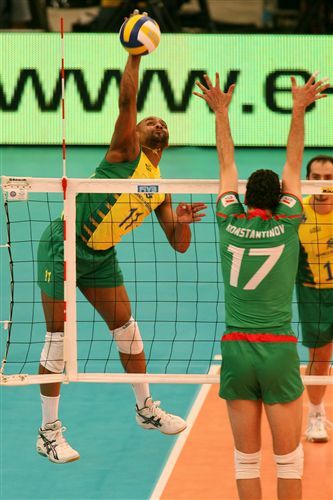 The hitter should hit the ball from the setters set. 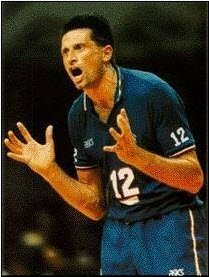 And passers should pass the ball for the setter. When having that in place, the defender learns to read the spiker, the speed of the set, the setter and the location of the pass. When practicing volleyball skills in blocking, it is important the blocker gets opportunity to practice "reading". The blockers need to learn to read the passer, the ball which is passed for the setter, the setter, the ball which is set for the hitter, and the spiker who will hit the ball over the net. So, the perfect set up to practice volleyball skills in blocking is having somebody to serve the ball over, pass the ball for the setter  and having an approaching hitter to swing the ball. (In some cases when practicing defense or blocking the coach may choose to have the offensive player on the stand. I.e. if players are not skilled enough to swing an accurate ball for the blockers and defenders, it could be needed to have the spiker on the stand to hit the balls. However, it is not the best possible option since the spiker is not approaching, or the ball is not set for the spiker, or the pass is not performed. For beginning volleyball players all the complex volleyball skills needs to be taught by focusing on one piece at the time. 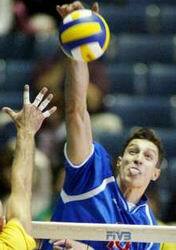 For example when teaching the spike approach very few players are able to pick it up correctly as a whole. When teaching the spike spike approach the coach should ask players to focus on the footwork first  without even worrying about other parts (yet). The coach focuses solely on the footwork at first. Then when the footwork has been learned, the coach asks players to focus on connecting the arm usage with the footwork, etc, etc. The same concept can be applied for more experienced players when practicing for example attacking. First, we teach an outside hitter to hit a line swing the line  and repeat it one after another. Secondly, we teach outside hitter to swing angle - then to use the block  then to swing after the own pass. The list of skills continues on and on. I.e. we can vary the speed of the set (high set, shoot), etc. All the volleyball skills are learned through repetition. All the different volleyball skills need different motor skills. For example right side hitting is different from the left side hitting. If the player is only practicing left side hitting, s/he will never become a skilled right side hitter. Or if players only practice hitting angle, they wont learn to hit the line. It helps players to learn the volleyball skills effectively when repeating the specific skill over and over again. Does this make players like robots? No, it makes them completely the opposite, very creative players. Each spike differs slightly from the other spikes. Once players learn all those slightly different motor skills, players are able to use them all in the game and become very creative players. They become players who are able to adjust  and use different approaches and swings naturally in the game. They are not forced to one kind of approach or one kind of a swing anymore. On this page we just scratched the surface a little bit. You find much more information and drills examples in other pages. How to Pass? How to Set? How to Spike? How to Serve? After basic position and shuffling have been learned players are ready for volleyball drills, which teach the technical volleyball skills - passing and setting to begin with. To read more about the basic volleyball skills, follow the links in the bottom of this page. You can use volleyball mini-games to improve technical volleyball skills. Mini-games are one way to make volleyball skills training more fun and exciting. Read more about Mini-games in "How to Play Volleyball"-section. Why Developing Skills is Important in Volleyball? Learning volleyball skills is the single most important thing in volleyball. How to Learn Volleyball Skills Properly? Beginning volleyball players may find volleyball very challenging since volleyball skills could be difficult to learn - harder than in other ball games. Learning basic volleyball skills takes lots of patience and countless repetitions. Players simply need to do tons of repetitions to learn the skills properly, which makes volleyball training challenging also for the coaches. How to Keep Volleyball Skills Training Interesting? There is a challenge for the coaches to keep drills interesting and players motivated - and avoid long monotonous, repeating drills. In the pages we present few ideas how to make skills training and continuous repetitions more fun for the players. Often technical skills training is associated with beginning volleyball players, but top level volleyball players also spend lots of practice time to hone technical skills. Often technical drills for top level players are more complex, but you may see them do the very basics also. It is a very common sight to see professional caliber players to sharpen passing skills by passing the ball after another in practice. The same principles of learning - i.e. repetition of a specific skill- apply to beginners as well as more experienced players. While improving basic volleyball techniques it is also important to start learning about tactical side of volleyball, in other words volleyball strategies. Game-like drills, which mimic the game closely help players to transfer their skills to the game - also give the coach opportunity to teach volleyball strategies for the players. 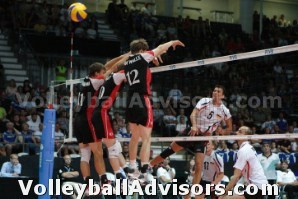 To read more about these games, go to Steps for Playing Volleyball page under How to Play Volleyball -section. Essentials of Volleyball Passing This passing section of basic skills focuses on few the most important aspects of passing. Advanced Volleyball Serve Receive Techniques Going beyond "perfect passing form" and extending your passing range. Overhead Volleyball Passing Learning how to use overhead serve receive. Controversial Volleyball Serve Receive Technique Read about controversial serve receive technique, which is widely used by the best volleyball players in the world. Various Volleyball Passing Techniques Get familiar with various passing techniques. Take a look at pictures. Volleyball Passing Skills: Shanking Balls in the Game? How To Fix It? How to Improve Volleyball Skills How to improve volleyball passing skills during the match? How to Improve Volleyball Passing Skills 2 More volleyball serve receive tips. Passing badly? Tips to start passing better in the match. Essentials of Volleyball Spike Explore the volleyball spike section and receive tips to become skilled at hitting volleyball. Includes the most important tips for the volleyball spike. Volleyball Transition Read and check out the videos about volleyball transition. How to transition from a blocker to a hitter? How to transition from a blocker to a defensive player and then to a hitter. Skills - Essentials of Volleyball Serve The basics of volleyball serve will introduce some ideas to become an efficient server. Discover important serving tips. Basics of Volleyball Digging Learn the posture in digging. How to dig the ball which is landing on the side? Learning More Volleyball Digging Skills - Hard Driven Spike How to dig hard driven spike? Volleyball Overhead Digging Read about volleyball overhead digging. How to dig with open hands? Volleyball Digging Rolling Diving How to dig, roll and dive? What is a pancake? Volleyball Blocking Basics - How to Put the Ball Down? How to stop the hitter? How to put the ball down into the opponent's court? Volleyball Blocking Skills - How to Place the Block? How to place the block? When to jump? Blocking in Volleyball - Read the Hitter How to know which direction the hitter swings? How to read the hitter? Basic Skills in Volleyball - What is "Volleyball Juggling"? Learn ball control and hand-eye coordination with "Volleyball Juggling" drills.